Geopathic Stress is the name given to natural or man made energies emanating from the earth which are detrimental to human health. In simpler terms this is negative vibrations rising up through the earth causing electromagnetic fields which can come from subterranean running water, mineral concentrations, fault lines, caverns etc. EMF emissions, electromagnetic field emissions from electronic equipment like computers and mobile phones, wi-fi, blue tooth are further adding stress to the environment and our wellbeing. EMF emissions are blamed for an increase in many types of cancer. Mobile phone masts, substations, pylons add further to the burden on our health emitting dangerous levels of E.M.F if one is living or working within 500 metres. Geopathic stress is a vastly underestimated threat to our emotional and physical health and interpersonal relationships. It has been on the increase in recent years and should be checked for by anyone suffering health or relationship problems of some kind. How can geopathic stress affect you? Dowsing for Geopathic stress – how does it work? Most people readily associate dowsing with finding water! However you can use dowsing rods and pendulums for so much more including negative grid lines, health, medicine, allergies, chakra balancing, archaeology, alchemy, finding hidden artifacts and minerals, spirits etc. Dowsing is a skill that anyone can learn. 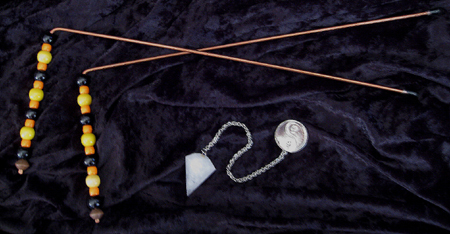 Before you practice you do need to discover what the movement of the pendulum or dowsing rod means. The first step is determining what your responses mean. Your responses may vary from another person’s but that is fine – what works for you is all that counts! See Dowsing with L-Rods and Dowsing for the Paranormal for more information. To start dowsing for Geopathic stress lines draw a plan of your house. State firmly in your mind that you are looking for Geopathic stress lines; then systematically walk through each room of your house marking on the plan where the dowsing rods cross or the pendulum swings to the Yes position. How do you treat geopathic stress? The most effective way of dealing with geopathic stress is to move one’s bed. Once the geopathic stress lines have been identified, the simple measure of moving out of the area of geopathic stress often solves the problem. The further the bed can be moved the more likely it is that one gets out of the stressed area. For some it is impossible to move their bed and in this case other methods need to be tried. These are worth doing anyway, even if it is possible to move one’s bed, as a back up. It is possible to block off geopathic stress by means of a layer of cork placed under the bed. A layer of cork tiles or bath mats, available from DIY and furniture stores can be used. It is also possible to obtain large sheets of cork from specialist suppliers. The scientific reason for this to work appears to depend on an observed association between geological fault lines and oak trees (which produce cork). The oak tree seems to have evolved its own defence against geopathic stress which is present in cork. How can geopathic stress be neutralised? A variety of methods can be used to harmonise geopathic stress, including crystals and mechanical devices. Rose quartz and silicon carbide crystals are considered to be very effective in counteracting the harmful effects of radiation, so they are often placed in geopathically stressed areas of houses. There are also devices such as RadiTech Neutraliser or Bailey Stressbuster, which can remove the effects of geopathic stress. Another simple solution that can be tried is the placement of an energetic grid over the affected area. This is a green energetic grid that is programmed to absorb all negativity and is refreshed on a six monthly basis. Please note that it may take up to six weeks for the effects of geopathic stress to clear. It is important to realise that environments are like our physical bodies — they are energy systems, have levels of consciousness ranging from the physical to the spiritual, have energy flows around, through, and within them, and can be in a state of balance or imbalance. The grid lines that run through an environment are like the meridians of our bodies, and like our own bodies, environments are alive and continuously impacted by the energy qualities that come into it from outside sources. Sometimes these factors vary over time, and, like our own bodies, can be in balance one day, and out of balance the next. Like ourselves, environments require some constant source of beneficial energy to maintain health and well-being. Opening of windows to allow for cross flow ventilation, smudging and energetic clearing of the home is recommended on a regular basis.